The Konnor Strong Lumbar Support Waist Cushion Backrest Pad is made of memory foam, and comes with a removable velvet case. Although the pillow itself is not washable, the soft protective cover is easily removed to make cleaning simple. Just remove the cover and toss it into your washing machine. 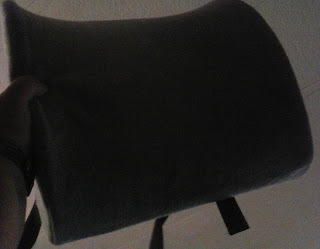 This lumbar cushion provides a great deal of support for my back whether sitting at my desk or in my car. 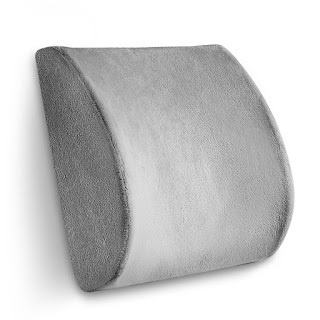 The contoured shape design for this lumbar pillow helps to improve your posture by supporting your back in the correct way to make sitting for long hours even when sitting in an uncomfortably hard chair. It helps to relieve back tightness, pressure and pain. It has an attached elastic band which can hold it in place at a chair in your office, or you can simply place it in any chair, car seat, or wherever you want a more comfortable seat. I use mine mostly at my desk, but it would be great in many other places around the home, office or car as well.